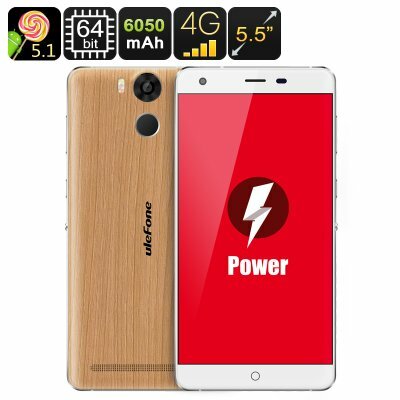 Successfully Added Ulefone Power Smartphone - 5.5 Inch IPS Screen, Android 5.1, 3GB RAM, 64Bit Octa Core CPU, 6050mAh battery, Dual SIM 4G (Wooden) to your Shopping Cart. With its metallic alloy body a stylish wooden styled back cover and 2.5D Arc screen the Ulefone Power is aesthetically pleasing and brings superb durability both in the materials used and its long life battery. The Ulefone Power with a huge 6050mAh battery has all the power you're ever likely to need. With Quick Charge technology the Ulefone Power can be fully recharged in just a couple of hours or bring as much as 2 hours of talk time after just a 5 minute charge. When fully powered up you can chat nonstop for days on end thanks to this super battery and charging technology. The Ulefone Power sports a full HD 5.5 inch IPS display for pin sharp images that and its 2.5D curved glass brings a meticulous finish that is smooth to the touch and beautiful to look at. Protected by Corning Gorilla Glass 3 the screen is robust and resilient so will resist scratches and damage to always bring you a great image. Whats the point of a huge battery unless you can take full advantage of all that juice. well with a 64Bit Octa Core, MTK SoC running at 1.3GHz and backed up by 3GB or RAM the Ulefone Power certainly lives up to its name. Its more than capable of running all your apps and games without even breaking a sweat. and with16GB of onboard storage as well as the 128GB micros SD card support you certainly won't be running out of space or power any time soon. Enjoy a great user experience with the Android 5.1 operating system that's coupled with smart wake, gesture sensing, smart motion and fingerprint scanning so security and intuitive use is synonymous with the Ulefone Power. With dual 4G SIM card slots streaming online movies and keeping in touch has never been quicker. The phone has front and rear high res cameras and makes use of Sony technology your guaranteed to capture beautiful memories from each and every shot. The Ulefone Power Smartphone comes with a 12 months warranty, brought to you by the leader in electronic devices as well as wholesale Chinese Android phones.